Or, if there’s no room or time for that sentence, perhaps a simple bot at the top of the conversation. That way, we can save our human emotions for the humans who will appreciate them. Quacking like ducks, et cetera. The point of the post is a bit different (it’s predicated on there being able to tell the difference — “… only a minute or two into the interaction that you realize you’re being fooled by an AI, not a caring human”), but what happens when you can’t tell the difference? Should AIs always announce themselves as AIs if they are indistinguishable from a human? Why? I’m currently working on migrating a Rails application to ECS at work. The current system uses a heavily customized Capistrano setup that’s showing its signs, especially when deploying to more than 10 instances at once. While patiently waiting for EKS, I decided to use ECS over manage my own Kubernetes cluster on AWS using something like kops. I was initially planning on using Lambda to create the required task definitions and update ECS services, but native CodePipeline deploy support for ECS was announced right before I started planning the project, which greatly simplified the deploy step. The current setup we have now is: a few Lambda functions to link CodePipeline and Slack together, two CodePipeline pipelines per service (one for production and one for staging), and the associated ECS resources. 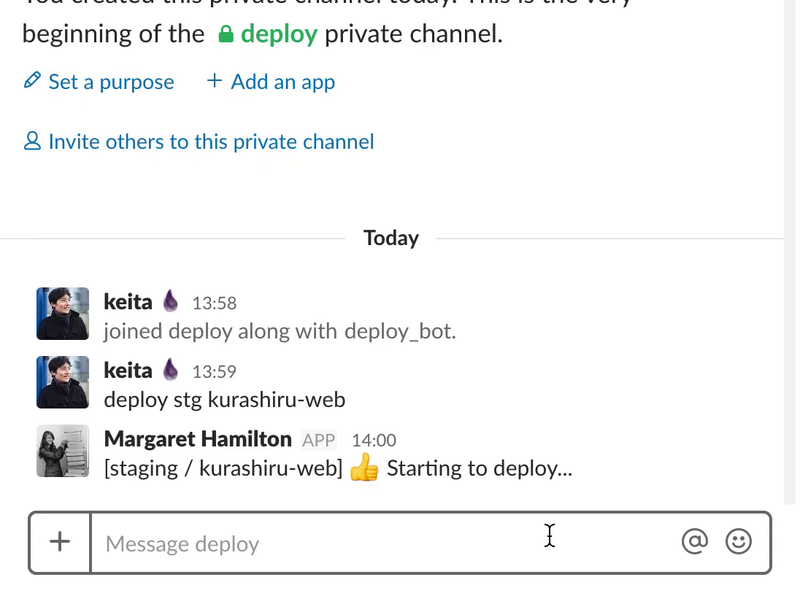 First, a deploy is triggered by saying “deploy [environment] [service]” in the deploy channel. Slack sends an event to Lambda (via API Gateway), and Lambda starts an execution of the CodePipeline pipeline if it is not already in progress (because of the way CodePipeline API operations work, it’s hard to work with multiple concurrent runs). This Lambda function also records some basic state in DynamoDB — namely, the Slack channel, user, and timestamp. This information is used to determine what channel to send replies to, and what user to mention if something in the deploy process goes awry. CodePipeline then starts CodeBuild, which is configured to create Docker image(s) and a simple JSON file that is used to tell CodePipeline’s ECS integration the image tags the task definition should be updated with. When CodeBuild is finished, a “manual approve” action is used to request human approval before continuing with the deploy. In the example here, I have it turned on for staging environments, but it’s usually only used in production. In production, we normally have 3 stages in the release cycle — the first canary deployment, followed by 25%, then the remaining 75%. The rest is relatively straightforward — just CodePipeline telling ECS to deploy images. If errors are detected along the way, a “rollback” command is used to manually roll back changes. When the deploy is finished, a Lambda function is used to send a message to the deploy channel. We use fluentd to process and route log events from our various applications. It’s simple, safe, and flexible. With at-least-once delivery by default, log events are buffered at every step before they’re sent off to the various storage backends. However, there are some caveats with using Elasticsearch as a backend. The general flow of data is from the application, to the fluentd aggregators, then to the backends — mainly Elasticsearch and S3. If a log event warrants a notification, it’s published to a SNS topic, which in turn triggers a Lambda function that sends the notification to Slack. The fluentd aggregators are placed by an auto-scaling group, but are not load balanced by a load balancer. Instead, a Lambda function connected to the auto-scaling group lifecycle notifications updates a DNS round-robin entry with the private IP addresses of the fluentd aggregator instances. We use the fluent-plugin-elasticsearch plugin to output log events to Elasticsearch. However, because this plugin uses the bulk insert API and does not validate whether events have actually been successfully inserted in to the cluster, it is dangerous to rely on it exclusively (thus the S3 backup). Don’t forget to update the KMS Key Policy, too. I spent a bit of time trying to figure out why it wasn’t working, until CloudTrail helpfully told me that the kms:GenerateDataKey permission was also required. Turn it on today, even if you don’t need the auditing. It’s an excellent permissions debugging tool. Proudly powered by WordPress Theme: Twenty Fifteen Child Theme for kkob.us.